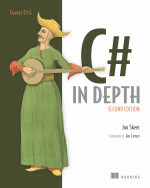 I really learned a lot from reading the first edition of C# in Depth, so I was very glad that I finally found some time to make my way through the second edition. The content on C# 2.0 and 3.0 was only slightly revised compared to the first edition. Never change a winning combination :-). But the final part of the book was the one that most interested me. This part discusses the features provided by the C# 4.0 compiler like optional parameters, named parameters, covariance/contravariance and last but not least, the dynamic keyword that got it’s very own chapter. The last chapter for this final part of the book is completely devoted to Code Contracts, which is not a language feature. I personally don’t like the way that Code Contracts are currently implemented by the .NET framework. I do hope that these concepts are going to be part of the C# language one day, which will be a major improvement regarding enforcing such contracts. Until that day, I think I’m going to stick with my own implementation. Anyway, I still think that the title of this book is spot on. If you want to bring your C# skills to the next level, then this book will be you guide. This book is filled with knowledge that only a true C# language expert can deliver. Definitely worth the time and effort.